LTTP: Batman The Animated Series. Confession time ERA, I never saw Batman: The Animated Series during my childhood, I can’t really remember what the deal was for broadcasting or distribution here in the UK during it’s original run to be fair. That said last year the entire series was released on Blu Ray and I patiently held out until I could snag the box set for a reasonable price, grabbing a used set. So I am now working my way through the series and I have some thoughts. The vibe/aesthetic is very unique, being set in what appears to be the 40’s or 50’s going by the clothing, cars and weaponry used by the villains, this is contrasted with more modern technology such as computers which are fairly common. This series owes its existence to Tim Burton’s 1989 film so I am not surprised that they adopted a lot of the stylistic elements from that film. One thing I am finding fascinating is the quality of the animation which is high overall but some episodes stand out by virtue of having much higher quality animation than others, I understand that this is a product of animation duties being outsourced to three different studios. So far I am up to Night of the Ninja (episode 35) and I am noticing that the animation in sone episodes was of much higher quality than what I hsve seen so far, particularly the facial work. Standouts include Two Face: Part One and Feat of Clay Part 2. Which blow away some of the other episodes by a big margin. I am so glad this series got made, I am a fan of 90’s marvel products from the time period, but comparing this directly to the Spider-Man series which released in 1994, it is quite clear that DC and Warner Bros really through their full weight behind this series. By contrast Spider-Man while still good is a little comical (pun totally intended) Spider-Man throws two punches in the entire series and all of the weapons are swapped out for sci if alternatives. Where as Batman is confronted by enemies using real world weapons and is free to use his fists in the manner which we expect. Also the themes in general are very mature for an animated series. Just going to wrap up by saying I wished I had seen this sooner, but now I plan to make up for lost time as I binge my way through the series. I had a long gap between my last binge watching session and where I am now, but soon I plan to dive back in and see if I can finish if this epic piece of TV making in the next week. The series is great and is one of the greatest animated series of all time. While it has a few stinkers, even its most normal episodes are fun and great. Yes the episode “I’ve got Batman in my basement” is just pure cringe, I watched it once, I don’t think I will be watching that one ever again. But overall I love the series. This is a very good show. I like that all the Villains have their own musical theme that reflects their personality. I bought the Blu-ray last week, and I'm literally watching it right now. If you're not burnt out when you're done consider checking the DCAU that follows (Superman TAS, B: Beyond, Static Shock, Justice League) as well. It's all good. I loved Batman Beyond (They called it Batman Of The Future here in the UK) used to watch it in Toonami, i never did finish every episode though sadly. The Night of The Ninja was a disappointing episode. Make sure as you’re watching to also listen. Shirley Walker did an AMAZING job with the musical score and there’s a lot of episodes where she does the heavy lifting. “P.O.V.” is a great example of an “okay” episode kicked up a notch by having the episode’s theme change based on which member of the Gotham PD is telling the story. Huh, interesting. (: Usually folks have seen TAS if they've seen Beyond. It's probably worth a re-watch to see every episode and the film, Return of the Joker. It would be remiss to forget recommending TAS film, Mask of Phantasm too. Yeah imo you should just watch all of DCAU in release order, but Batman Beyond specifically is a great continuation of arcs from BTAS. Yes, I really enjoyed that episode, especially how each character had a different take on the events. I wish more series would attempt this. Much of the voice cast that did NOT stay with the series or the characters themselves were also noteworthy. Many of the episodes were pure masterclasses in the voice acting trade at the time. Andrea Romano is an absolute legend. She was voice director on the show, pay attention to the acting as much as the words coming out of these cartoon characters, they really do sell the scene/setting/batarang to the face. Been watching on blu Ray, and the show looks and sounds amazing. Yup, Shirley Walker was awesome. Her Fourth World stuff for Superman : The Animated Series was even better. If memory serves, CITV showed it back when it was first on. I have some very vague memories of it being on weekday afternoons, but I think most of it was probably shown on their Saturday morning show - it might have been What's Up Doc? at the time, not sure. Sky One then showed it in the mornings for a few years in the 200s, but I don't think it's been on TV since then. I was pretty late to seeing BTAS myself - not until I was a student, as a matter of fact! - but I'm glad that I came across it eventually, as the work that went in to it really shows. If you're interested in learning more about how the show got made, there's a really good - and surprisingly long - feature on the bonus disc at the end of the blu-ray set that you might want to watch. Your memory serves you correctly Alexem, it was first shown on 'What's Up Doc? ', which had a Warner Brothers theme throughout and was the first place Batman: TAS, Animaniacs and Taz-Mania were shown in the UK. For now I am just sticking with the Batman series, maybe I will look the rest of the DCAU after I finish watching TAS. Man I really need to watch this series. It's considered one of the greatest animated shows of all time for a reason. It hasn't aged a day. In fact, they don't make em like this anymore at all. Very few duds in the series run and, like a lot of WB stuff of that era, the style and animation has aged incredibly well. Feat of Clay Part 2. I have a lot of production cels from the series but one of my standouts is from this episode and Clayface wrecking shop. The animation in that episode is gorgeous. In my opinion it's one of the greatest television shows to ever exist. It's quality was basically an accident-the studio just wanted an animated series to capitalize on the Tim Burton film's popularity-but getting Paul Dini and Bruce Timm on it was fortuitous because they treated the characters and world with love and reverence. Do yourself a favor and get a subscription to Stitcher and listen to the first episodes of Kevin Smith's Fatman on Batman podcast. He interviews the creators and voice actors of the show and it's magnificent. He even sits with Paul Dini and they watch a few episodes and provide commentary. Early DCAU is all amazing. Should get around to it if you have time after BTAS. Some of the somewhat later stuff like Teen Titans and Young Justice are also really good as well. It'd make for an interesting story if the show wasn't aimed at a younger audience IMO. Heart of Ice was so damn good. Mark Hammill talks on Fatman on Batman about this and the voice recordings. 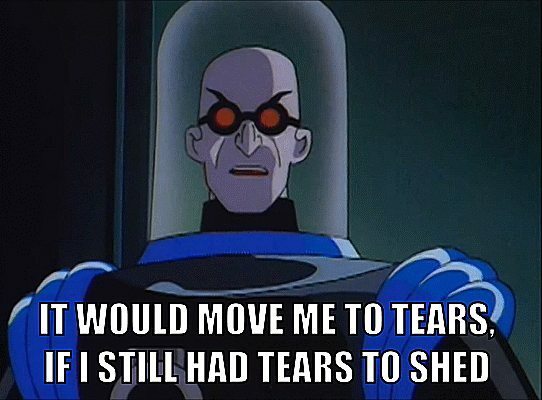 The guy who did Mister Freeze was a real professional and then every recording he did, the producers would tell him "No no, LESS emotion." I kind of liked that one. Had a good sequel episode too. Truth. Conroy and Hamill get all the attention, but their were plenty of VA's just as good on that show, with some characters being the definitive portrayal for me. This SO much, I grew up with BTAS, but I didn't catch up with the other stuff until 10-15 years later. I daresay I enjoyed Justice League/Justice League Unlimited even more than BTAS, it was truly fantastic. Young Justice was also quite good, although it took me some time to warm up to it. Also important, several of the modern DC Animated Movies are spectacular as well; Wonder Woman, Batman: Under The Red Hood, and Justice League: The Flashpoint Paradox especially. I have seen the end scene of Under The Rood, it was amazing, I plan to watch the whole thing one day after I finish TAS.